I signed up for Toddy’s afternoon tour to Simpson’s Gap and Standley Chasm and was soon roaring out of town in the Toddy’s bus. Clouds dotted the brilliant blue sky, and it was a glorious day. As we passed through Pitchi Ritchi, I did notice that there was a motel now on the site where I had camped during the “flood tour” from my last strip. It made me wonder what other changes I’d see. Still, the surrounding rocks were still dramatic and dynamic looking. My pulse quickened a bit, as we rolled into the red land. On my previous trip to Australia, though I had already been in the country for more than three weeks by the time I got to Alice Springs, it was here in the Centre that I began to really transform–and truly fell in love with Australia. And now, finally, having succeeded in beginning my life over, I was coming back to the place where it started. But would I feel the same about it as I had during that first, seminal visit? It didn’t take me long to learn the answer: absolutely. What a gloriously beautiful land this is. It hardly seemed possible that eight years had passed since I was here, in the (almost) unchanging Centre. 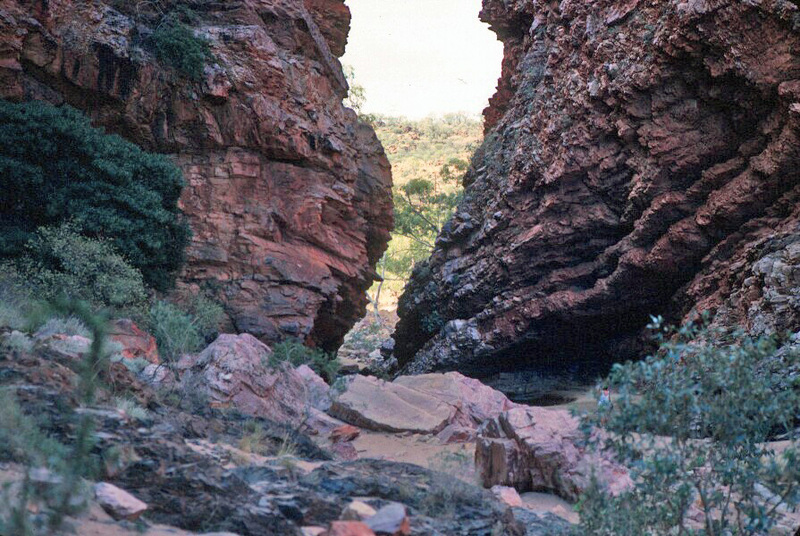 The red earth rolled away from the road, dotted with mulgas, corkbark trees, desert oaks, and ghost gums, bounded in on one side by the dancing red wall of the MacDonnells. We stopped first at Standley Chasm. This being my third visit to the spot, it hardly seemed necessary to shoot a whole roll of film–but maybe I missed something the last two times. 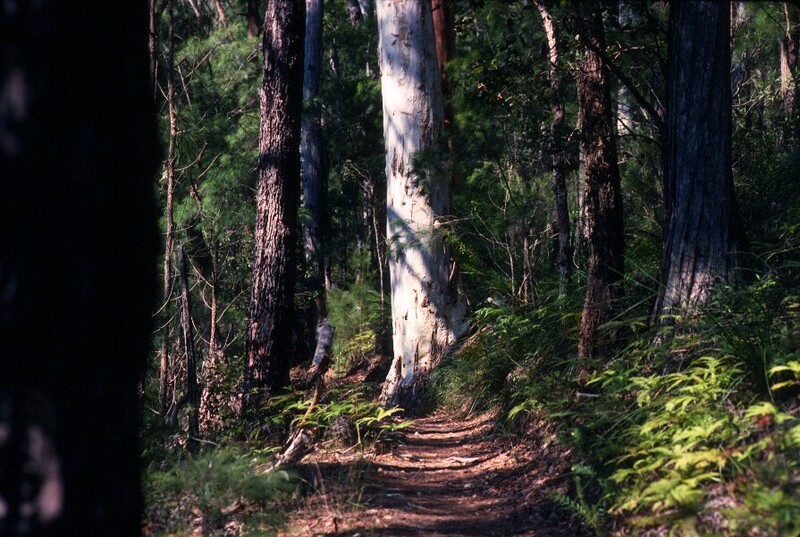 Hiking in, along the winding path that leads to the chasm, I saw my horse head stone, though it was broken, and I again found the burned out trunk of the old gum tree that had four new gums growing out of it. 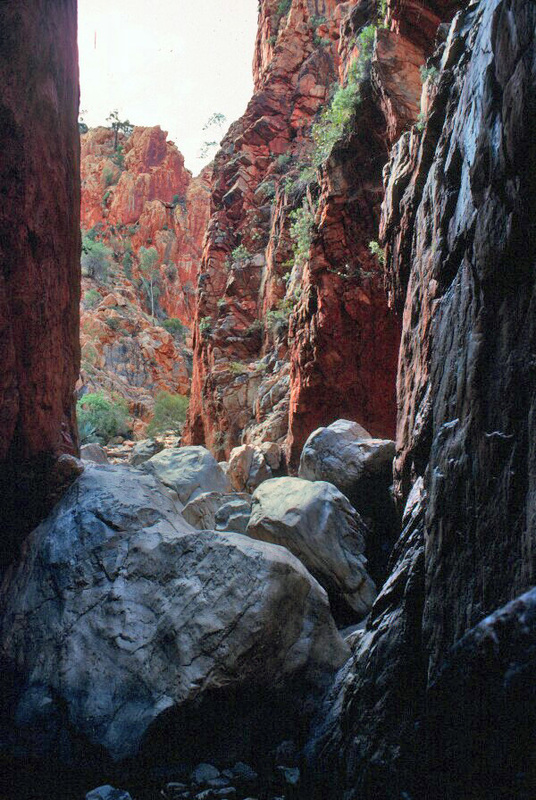 Reaching the chasm, I wandered between the tall, parallel walls to the tumble of rocks on the far end. It was as if no time had passed. Next we headed for Simpson’s Gap. Aspects of it looked the same, particularly the distinctive gum tree spreading its arms at the entrance to the gap, as if in welcome. We only had a short stop here, so we hiked in and hiked out, without much time for exploring, walking mostly along a footpath constructed since my last trip by inmates from the nearby Alice Springs Gaol. I was a little disappointed, as the walkway takes a bit of the romance out of the place. However, it does make for much easier going than slogging through the deep, soft soil of the sometimes riverbed. And the wonderful, worn rocks have not changed, and I delighted in those. During the drive, we passed many sights that were familiar to me, including the memorial grave of John Flynn (Flynn of the Inland) and the famous Namatjira twin ghost gums. The driver was just that: a driver, so he said nothing about our surroundings. The others along on the day’s drive were almost entirely British university students, mostly young men around 20 years of age. Since no information was being shared by the driver, I began to point things out and relate what I knew of the mountains, gorges, plant life, and sights. I began quietly, speaking only to those near me, but found an eager audience, and I was soon surrounded. I was, of course, more than delighted to answer the questions with which they peppered me as we blasted back across the 50 kilometers to Alice Springs and Toddy’s. It was still dark when I got up this morning. I finished packing, dropped my key in the drop slot at the front desk, and headed for the front door, where a taxi was waiting for me. We drove through the city and out along the river. Away from downtown, Brisbane is largely unchanged. The dawn was glorious. The just-past-full moon still hung in the deep blue sky. Mist was rising from the river. Opposite the moon, a silver and pastel sky brightened until the huge, orange, fireball sun topped the horizon. It was splendid. Brisbane airport is hugely spacious and filled with plants. At this early hour, I breezed through and out to my gate. We took off on time for Sydney, heading out over the ocean and nearby islands before swinging south. 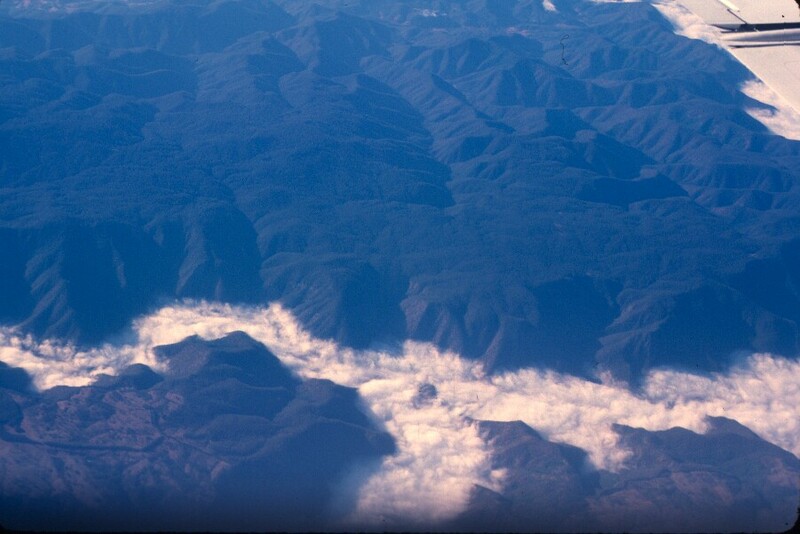 We followed the Great Dividing Range, and below me, the mist-haunted mountains looked beautiful and green: dark green of forests, brighter green of paddocks, fields, and clearings. 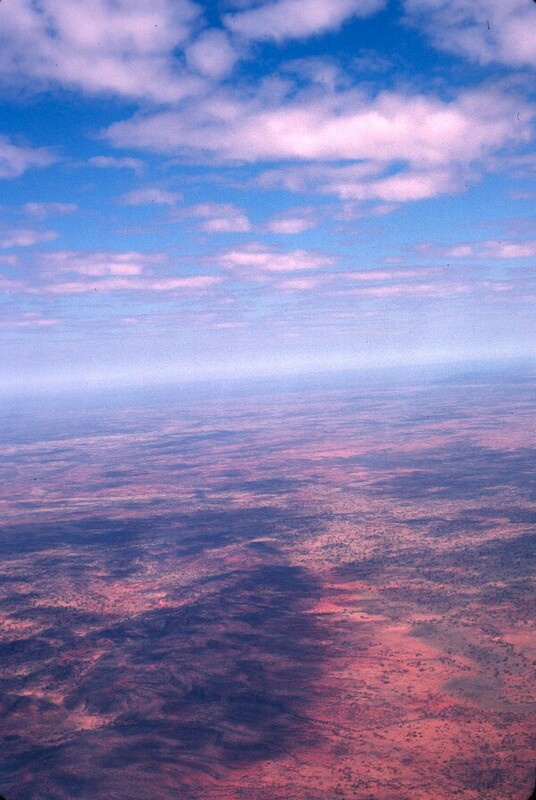 In Sydney, it was an easy stroll to the gate for my flight to Alice Springs—and then out over the broad, red land. My seatmate on the flight was a delightful woman from the office of Aboriginal Affairs. By the time we landed, we were well enough acquainted to happily share a taxi into town. My heart sang as we crossed the rust-colored miles to town and nearly burst as we passed through Pitchi Ritchi, the pass through the MacDonnell Ranges that admits passengers from the south into Alice Springs. It’s unbelievably good to be back. We reached my destination first, Toddy’s Backpacker Cabins, and I was dropped off. Toddy’s offers a level of accommodation equal to some of the places I stayed toward the end of my previous trip: clean, safe, cheap, laid-back, friendly, and very basic. I was shown to my room across a broad yard and then given a tour of the facilities, including the shower block, barbecue area, small shop for necessities, and laundry. The furniture in my room is a bed, a chair, and a large, strange wooden contraption that appears to have been designed to hold a couple of backpacks. The floor is linoleum, which makes sense given the pervasiveness of dust. There is a hand basin (cold water only, but still, nice to have water in the room). But it is enough. The yard is littered with 4WDs, and a dog was sleeping in the dust as I passed. The clientele is pretty young, and the staff appears to be a mix of young locals, young Europeans, and older Aborigines. This place is perfect for Alice Springs. A bonus I quickly discovered is that these folks are really into the whole outback experience. They offer cheap tours, bike loans, and if you can get six people together, George, a member of the staff here, will drive you anywhere you want to go. Plus tonight, they’re having a barbecue (with kangaroo on the menu). Could hardly ask for more. After about an hour of driving, the Gold Coast appeared on the horizon, the line of high rises in the distance looking like broken teeth at the mouth of the green valley, with the ocean beyond, shimmering invitingly. A while later, we dropped some people in Nerang (the fastest-growing town in the Gold Coast, we were told), and then continued on to Brisbane. The sun was just setting as we pulled into the Brisbane Transit Centre. I shouldered my pack, tripod, and camera bag, and, in the blazing orange sunset light, I headed through the Roma Street Gardens, then turned up Albert Street for the climb back to my hotel. It was dark when I reached the hotel. I stopped at the desk to pick up my big bag, used the free taxi phone to order a taxi for the morning, then said farewell to the hotel manager and his wife, since I’ll be gone well before the front desk opens tomorrow morning. I’d brought some fresh fruit back with me, and I had a banana and a “custard apple” for dinner. I’d been told I should try the custard apple, and while it was not yet quite completely ripe, it was still lovely and very much like custard. 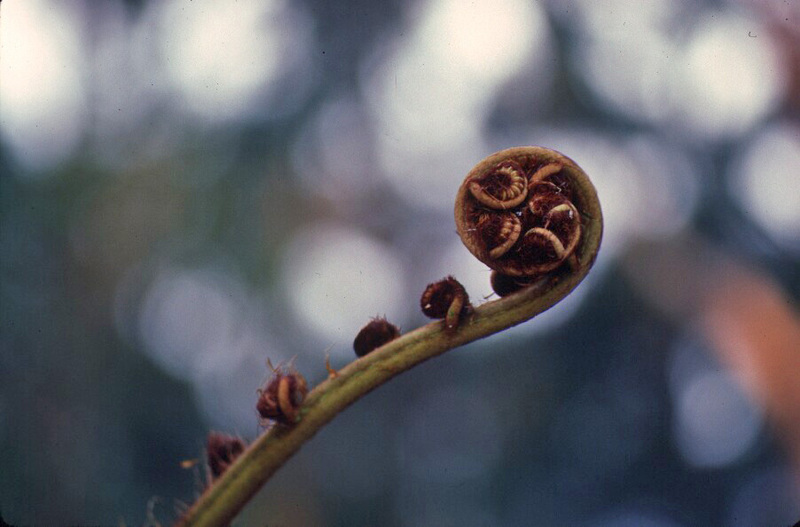 The gnarled, black exterior hides a creamy, white interior dotted with large, shiny, black seeds. The soft flesh has both a flavor and texture that make it easy to see where this fruit got its common name. Then it was time to pack and prepare for tomorrow’s departure. I’m sorry to be leaving Queensland, but I’m very excited about getting back to the Red Centre. I set my alarm for 4:50 am, and by 9:00 pm, I was pretty well ready for bed–and for my departure tomorrow. At this lovely spot, James lowered his backpack and produced scones and fruit. Mike and Greg (two regular visitors to Binna Burra who were on the long hike yesterday) also had packs, and they unloaded billy cans, water bottles, and portable fuel jars (no open fires up here when it’s this dry), and we boiled the billy for morning tea. Above us, bees hummed among the flowers in the tree tops, and all around us, rosellas flitted through the branches. While the billies warmed, we climbed a large mound of huge, lichen-stained boulders for a view back through the forest. James mentioned that the reason the beech trees were so close together is that, when a tree dies, new trees start up almost immediately from the base of the old trees. With tea finished and gear repacked, we continued on. We left the beeches behind and were again enveloped by the rainforest. By 12:30, we were back at Binna Burra. I dropped my hat and sweater with my gear in the lodge, as the day was warming up. Then I set off across the broad clearing again, to take the Bellbird Track down to the Bellbird Clearing, where a barbecue lunch was being prepared. It was supposed to be a 15 minute walk, but it took me 25 minutes, because I stopped to photograph everything. The steaks were already cooked when I reached the barbeque area, and I served myself a steak and some “vegetable marrow” (zucchini), salad, and a large serving of fresh fruit. I think joined Mike on a log in the shade. We ate and chatted, and every now and then, I’d hand him my plate, say “Please hold this a minute,” and dash off to photograph something. 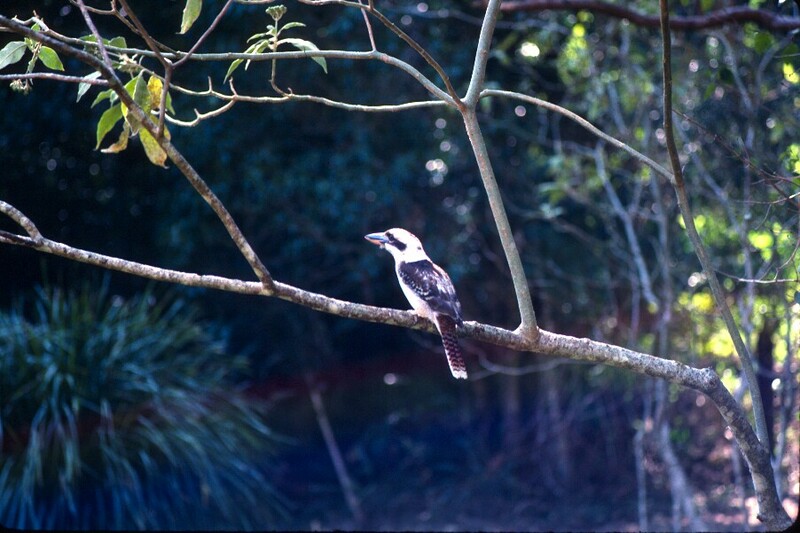 I was especially glad to get a nice shot of a kookaburra that perched on a branch near the edge of the clearing. After lunch, there was time for one last short walk, and a final wander around the lodge. Then, at 4 o’clock, it was into a minibus that carried us away from Binna Burra. Sigh. There was a lot of up and down now, with the vegetation changing every hour or so. About an hour after lunch, we came upon a large carpet python sunning itself on a rock. We stopped to watch it slide away, then continued our up and down hike. By 4 o’clock, we were back in the rainforest. Here, I got a lift from the amazingly fragrant native gardenia that was growing in abundance at one place along the path. The perfume surrounded us. It was, of the dozen or so lovely fragrances I’d breathed on this hike, the loveliest. It was beginning to get darker, and I was beginning to feel pretty weary. But you don’t have any option but to slog on. My next big boost came when we reached a turnoff to another trail, and there was a sign pointing ahead that said, “Binna Burra–4.7 kilometers.” That at least seemed manageable. I continued to be amazed by the lushness, the beauty, the variety around me. It’s like the flora is playing a game of “let’s see how many totally different leaf shapes we can come up with.” It’s astonishing. At one muddy bank, Jenny pointed out the little hidey-holes of the trap door spiders. Glen used the tip of a knife to carefully demonstrate how the silk-hinted trap doors work. Amazing. I had a Strongbow cider (which I’d discovered during my first trip to Australia) with my dinner, and amiable conversations with a substantial number of people. People who travel tend to strike up friendships easily, and I ended up with a lot of recommendations and some invitations–for next time. I didn’t really feel up to the 1-1/2 hour, flashlight stroll to see nighttime creatures (I figured I didn’t need much more than the adorable brushtail possums that climbed up on the porch to enjoy the fruit put out there for them.) It’s an early start again tomorrow, so I hobbled off to my cabin for a good, long stretch and then to bed. There were more flowers on this side of the valley: a variety of peas, some rock orchids, purple matchstick flowers (pink and purple flowers of the matchstick bromeliad–a flower that had delighted me on my first visit to the rainforest), and many others. Overhead, we could hear the crunching sounds that signaled that parrots were feeding on gum nuts in the treetops. We came to a broad, shiny, black swath in the cliff face, which Glen pointed out. It was a great seam of obsidian–volcanic glass–another relic of this area’s days as the edge of a giant volcano. 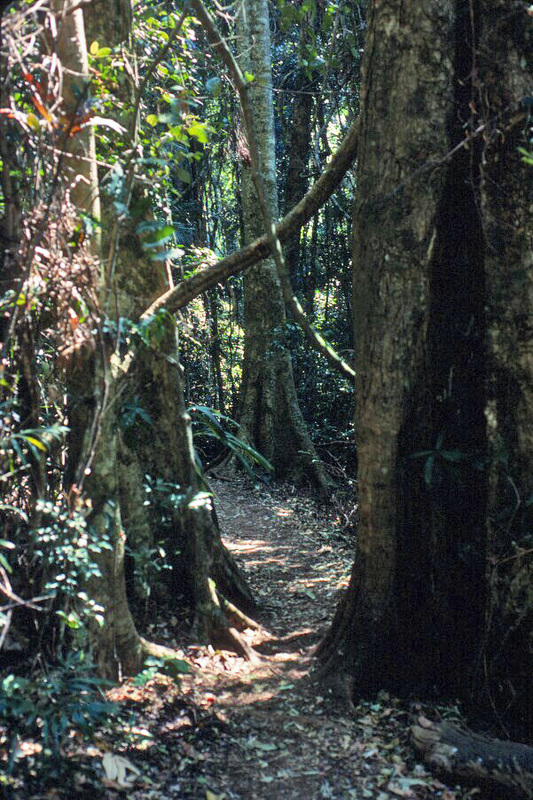 At one clearing, Glen also pointed out the distant Mount Warning–the remains of the massive volcano’s center. I felt something bite my neck, and I reached back to find a tick. I pulled it off (before I knew what it was), and when I saw it was in fact a tick (legs still moving), I threw it away in horror. Mike said I should have squashed it–then insisted on inspecting the spot it had bitten, to make sure I got it all. (Often, when you try to remove a tick, its head gets left behind. Fortunately, the whole tick had come away.) Everybody in the group got a brief case of the crawlies, as they searched to make sure nothing had gotten on them. Then Jenny noted cheerfully that, since it was so dry, at least we weren’t having trouble with leaches. Glad to hear it! My calf muscles were complaining as we continued our climb up the mountain. (Not certain why I thought my three miles a day on a flat walking track back home had prepared me for this.) Ken and Mike, seeing that I was struggling with my camera equipment as I climbed, took turns carrying it on the steeper parts of our uphill hike. (Everyone had a backpack, but I was the only one crazy enough to be carrying extra gear.) Their chivalry was hugely appreciated. I was breathing hard but was still enjoying my awe-inspiring surroundings. Grass trees became more frequent, most with the immense central spike that bears their tiny flowers. By 1 o’clock, we’d reached Kooloonbano Point, on the top of the far wall. 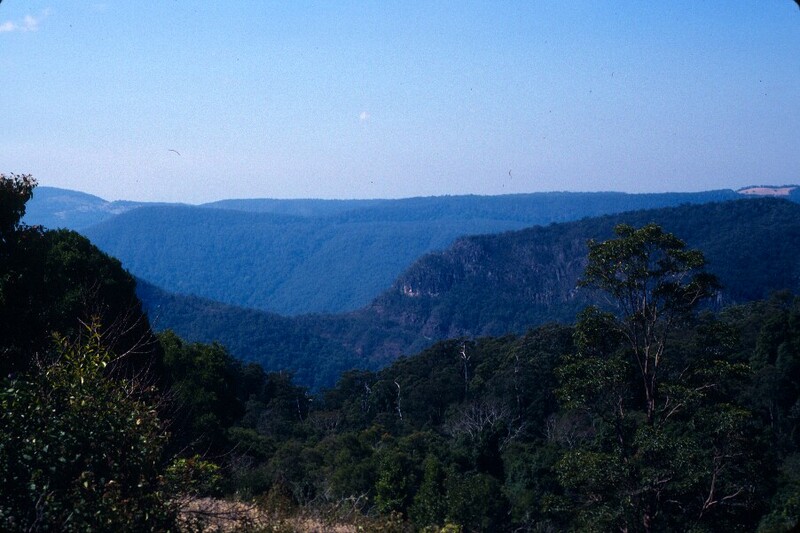 From here, we could see the whole Numinbah Valley, with Egg Rock and Turtle Rock far below. In a shady clump of sheoaks, we dropped our packs, sat down, and pulled out our packed lunches. I was starved, and I ate the sandwich and nut mix enclosed. Mike and I were chatting, and he suggested that I save the fruit for later, and not eat the nut bread at all. “You’re hungry, of course. But it’s a lot easier to climb if you’re not full.” Boy, was he right. I regretted having eaten soon after starting up again. Fortunately, everyone else was full, so it kept the pace a little slower for about half an hour.